While the original manga and anime tell a rather straightforward story based on shounen tropes (in the original, the hero has his mother eaten in front of him making him want to destroy all titans) complete with crazy twists and political intrigue, the film version works most effectively as horror while also heavily depoliticizing the story. The film’s opening set piece showcases most of the film’s strengths. The initial siege by the Colossal Titan is downright terrifying. Shinji Higuchi, responsible for the special effects of the Gamera films of the 90’s and also storyboards for frequent collaborator Hideki Anno, brings in his tokusatsu skills to the material effortlessly combining his titan actors with the scenery. Part of the series’ great appeal is the titans themselves. They’re dead-eyed mindless creatures that more often than not look downright goofy. Higuchi gets a lot of mileage out of simply watching his creations walk slowly across the frame, or be visible in the background. They trudge around, pick a human up, gaze at it quizzically and then proceed to bite into them, savoring every crunchy part of their flesh. There’s a genuine sense of terror in these images, something unsettling about them. – the titans get on their knees to scavenge for bodies in the crowd, gleefully tearing apart their organs. The humans watch in terror and flee for their lives. It’s a disaster film coupled with a giant zombie movie. Other set pieces pile on other twists to this basic formula. After our main characters join the army to fight back against the titans, they find themselves in a night-time excursion that gleefully riffs on the concept on what the titans actually are (and their biology) for some scary fun that leads to a showcase of the technology required to actually kill titans. The final battle sequences are downright horrific in their imagery and reliance on gore. More to the point, its action is imaginatively staged and realized – these are images which are provocative and staggering, even nightmarish. The final twist (revealed early on in the manga’s run) sets up the stage for the sequel coming out in a few weeks in the States. It deepens the mystery of the titans and promises even more variety in its action. The film’s weak link is, of course, on a human level. None of its characters ever become all that dramatically interesting. Mizuhara’s Mikasa goes from virginal naif to hardened warrior, but all that work happens off-screen. Miura’s Eren runs around being chased by titans all while looking for some kind of interesting characterization. But these character faults are mostly negligible. Attack on Titan, more than its source, sees its human characters as but figures in the frame, only notable in how they can be corralled into certain spaces en masse. They are figures dominated by terror, useful only as fodder for the titans, and for the audience to register their terror. Which is an effective strategy for the most part, but it does lessen some of the emotional impact that the film reaches for near the end. 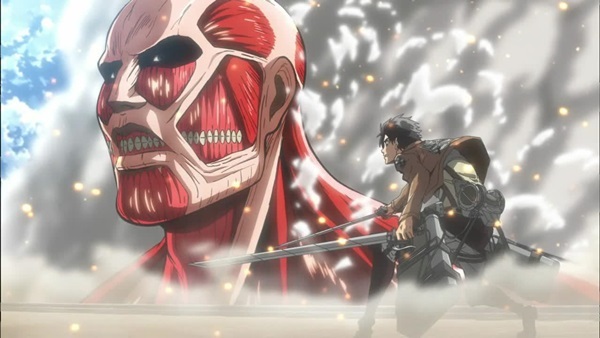 Attack on Titan is the latest in a series of anime-related films being distributed by anime companies in North America. Just a couple of weeks ago, the Love Live! The School Idol Movie also came out in limited engagement (I’m not the familiar with the property otherwise you would’ve seen a review of that as well, it played at the Grand Illusion in Seattle). It’s an interesting trend that’s somewhat similar to what’s happening with other Asian properties. These films are marketed aggressively to their respective audiences (whether its an Indian film or otaku bait) and mainstream criticism pays them no attention unless they happen to be from a somewhat notable auteur (such as Johnnie To). And, while the latest Naruto movie probably isn’t going to be that great, it’s still worthy of investigation. There are some interesting manga adaptations from the last few years that are worth watching that haven’t so much as sniffed any sort of international distribution. Hopefully, Attack on Titan won’t get lost in the shuffle. Attack on Titan will be showing this week in limited engagement at Grand Cinema, Landmark Guild 45th and Cinemark Lincoln Square.